Aliens are not barbarians, Firaxis is quick to point out in this hour-long playthrough of Civilization: Beyond Earth. While aliens are a separate AI faction, just like the barbarians in regular Civ games, there are a number of things that set them apart from their beardy, fur-wearing human cousins. The developer walkthrough is actually two games, one where the aliens are treated with extreme prejudice, like barbarians, and another where they are left alone to expand just like a normal faction. Aliens, unlike barbarians, have some intelligence behind them. They have attitudes towards different factions and how aggressive they are depends on how they’ve been treated in the past, or how threatened they feel. If humans get too close to an alien nest, they’ll be quick to defend it. And there’s variety too, from gargantuan sea creatures to skittering wolf beetles. 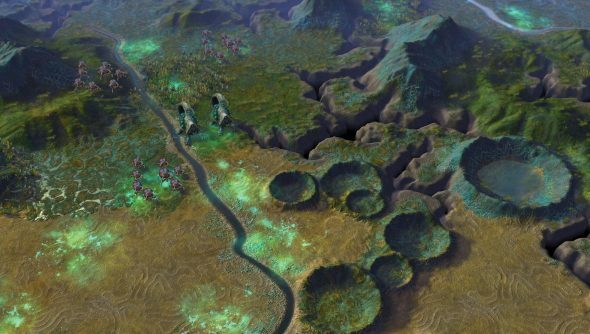 While the focus is on aliens, Firaxis shows off plenty more. There’s the orbital launcher, that sends up satellites and the like, which can provide bonuses to the area below them. We get a look at the tech tree, building options and a slew of other things as well. Notably the affinity system makes an appearance. Choices made in quests – like eradicating alien wildlife or leaving them alone – go towards the affinity of a faction, their vision of how humanity should grow.